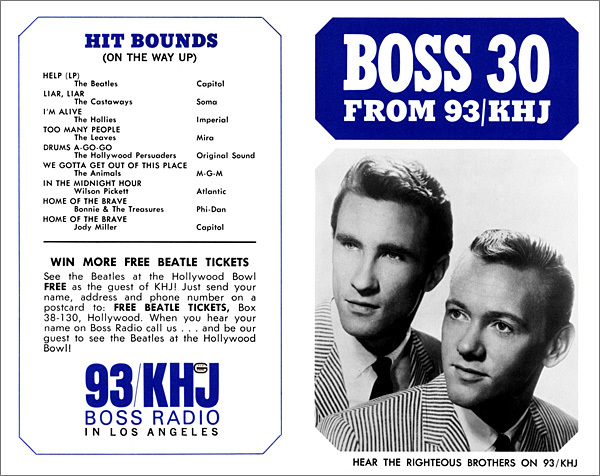 Issue #5 - Bill Medley and Bobby Hatfield looking sharp on the cover of the Boss 30. Terrific Blog Ray! 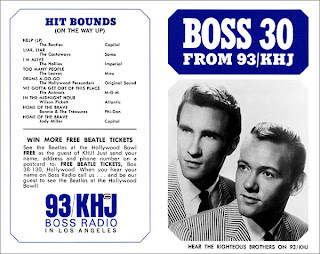 Found it through a link from pals in the reelradio.com community. Looking at the survey, all the memories of a carefree high school summer at Santa Monica beach come rolling back in. All the beach radios seemed to be tuned to 93/KHJ. 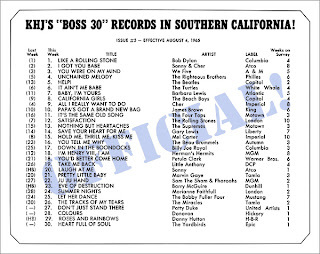 Love that Bobby Fuller Four hit at 25 on the chart - a west coast turntable hit for sure, but every bit as good or better than "I Fought the Law". Just picked up a stereo copy of "Let Her Dance" this month and it ROCKS! 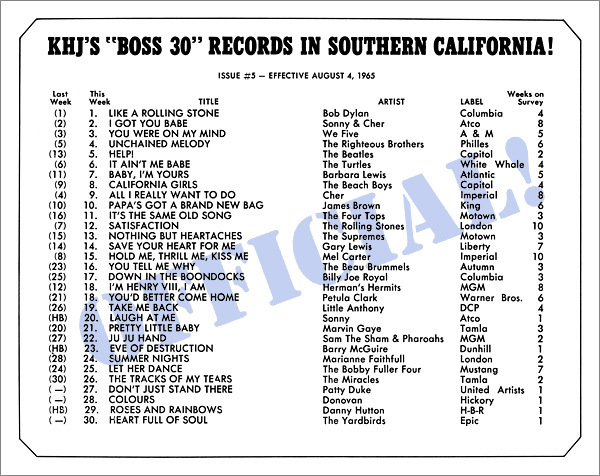 Love the Bob Dylan single at #1. This single was, if I remember correctly, almost 6 minutes long. It must have taken some real courage for KHJ management to allow so MUCH time to one song. But, what a great record it was. I think KHJ played just the first two verses of the song and then faded it out. At least that's how I remember it a few years later when it was played as a Golden. Ray, do you remember firsthand from 1965? I didn't start listening to KHJ until early 1966. Even then, I wouldn't remember what version was played as my memory for those kind of details isn't very good. I see the promo single for "Like A Rolling Stone" had the song split into two parts. Hopefully someone with better recall can chime in as to which version was played. They played both the long and short versions. Maybe the long version was at night. Or maybe they started with the long version and used the edit later. I remember getting used to hearing the 6 minute version and then thinking it sounded odd when the song was sometimes cut off halfway through. The Columbia white label (red vinyl ) promo 45 of "Like A Rolling Stone" has part 1 on one side and part 2 on the other. the fade up vocal intro of side 2 ...."it's 3:30 in BOSS Angeles!" He sounded surprised . Survey erratum: "You Were On My Mind" by We Five has the "Weeks on Survey" listed as 5. It should be 4.